Who else is dreadful with time management? I know I am. I need firm deadlines. If I don’t have a deadline, it’s possible it won’t get done. That goes for all aspects of my life, including housework. 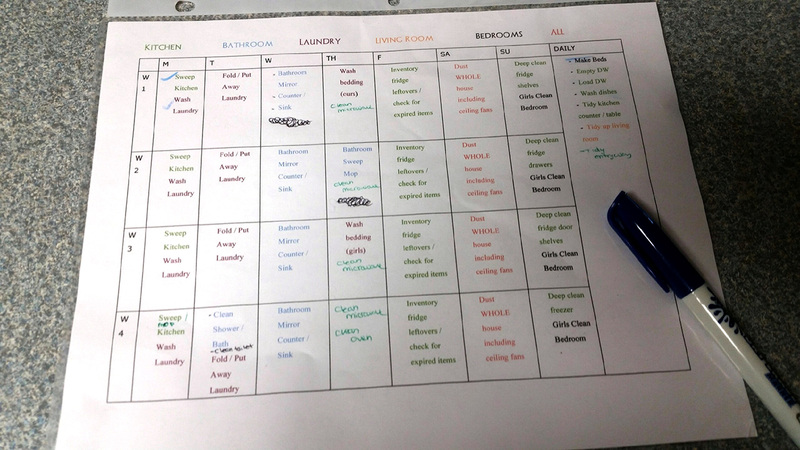 To help in my tidying up goal, I made myself a little chore calendar. It’s a rotating 4 week schedule. 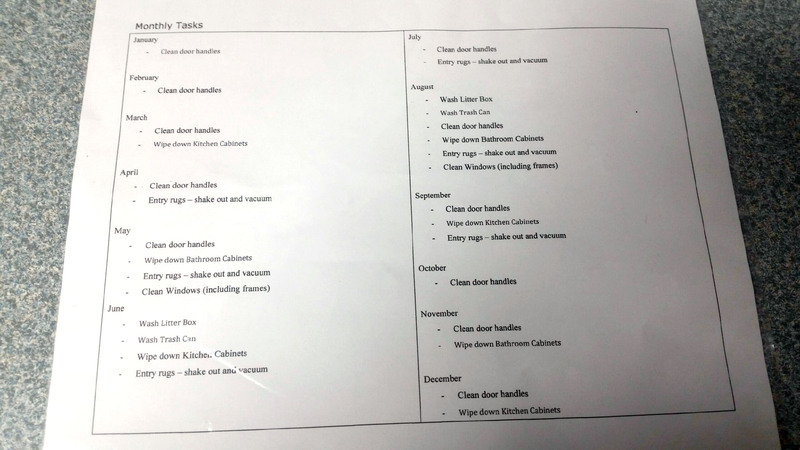 On the back I have a few monthly tasks with room to add more as I think them up. I started yesterday, and though I didn’t complete all of the tasks, I feel really good about the progress I’ve made. As my house gets cleaner and it becomes more maintenance than deep cleaning, I’m hoping this comes easier to me. I’ve never been so excited and optimistic about cleaning! And my kids were even eager to help! I “laminated” my list by placing it in a plastic sleeve and I’ve got a dry erase marker to check off the list as I finish. Each day I erase the daily list checkmarks and I start anew the next day. This is one of the BEST children’s books I’ve read in a while. My four year old daughter loved it so much, we read it twice, back to back. This is the story of a little girl who likes to make things. She comes up with an idea for the most MAGNIFICENT thing EVER. She gathers materials and begins working, but nothing she creates is as wonderful as the idea in her head. She starts to get really frustrated and mad. Her “assistant” (her dog) “suggests” they take a walk. And after walking away from the situation that is frustrating her, she gains a new perspective and realizes that all of her not-perfect things can be dismantled to become her most MAGNIFICENT thing. And in the end, even though she realizes her MAGNIFICENT thing isn’t quite right, she’s very happy with the results and I’m pretty sure, after the story ends, she’s going to keep tinkering until it’s perfect. I love this story for a few different reasons. 2. There’s a good life lesson in this story. Try, try again! And then keep trying! Step back, take a break, and look at things in a new way. And even when you reach your goal, think about more ways to make it even better. 3. The pictures are very cute, and the story is told in a fun, easy to read way. The language is clear, concise, and expressive, making it great for reading aloud. 4. The MAGNIFICENT thing the girl makes is very clever and practical, seeing the finished product was my daughters favorite part of the story. I would love to see this book in classrooms and I plan on reading it with my almost nine-year old daughter this weekend. She’s already very interested in making things, so I think she’ll really enjoy this story. This is a must read for boys and girls, and entertaining for parents as well. There are no flaws in my opinion and this may just end up under the Christmas tree from Santa, or on a birthday wish list! Following the KonMari method of tidying up is hard. After the first couple easy categories – clothes and papers – it’s really hard. Where do you start? How do you gather everything in one place, especially when you don’t even realize you have things? Maybe what I’m doing now is still purging and moving items to temporary homes. I’ve made a little progress though and I’m very happy with what I’ve done so far, though I’m not as far as I’d hoped I would be. 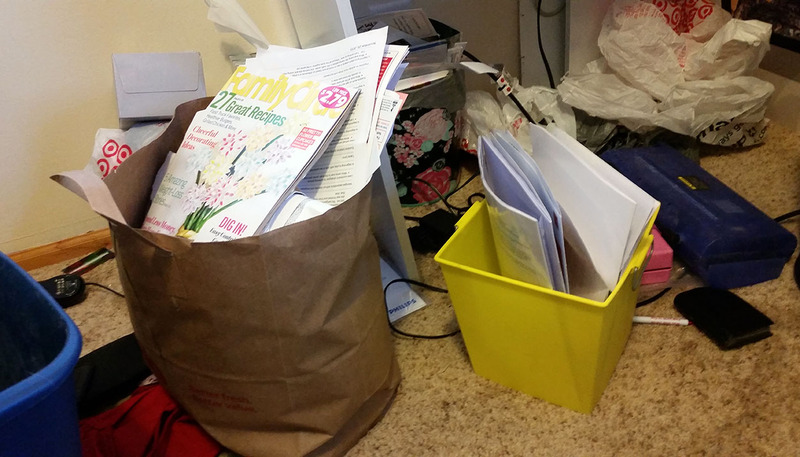 BEFORE – Confession, the white laundry basket of crap? I didn’t actually go through it all. Or the little blue basket. But I did sort through a bunch, I promise. And even so, the after looks a thousand times better! AFTER – I actually did remove the white hanging “shelf” shortly after I took this photo. I moved the contents into the white drawers instead. You can’t see in the photo, but there’s also a crib mattress behind the laundry baskets and the drawers. I need to get rid of that, but until I do, it’s staying. 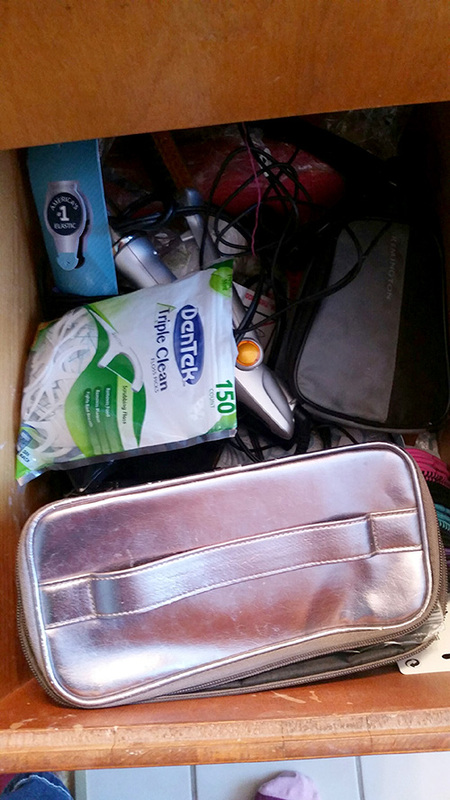 This is one of the drawers in my bathroom (we only have one bathroom for all 4 of us, deal breaker for some, but I grew up in a house with 6 of us – 3 of whom were teenage girls! – and 1 bathroom, so… it’s nothing new.) The silver case in the front is full of random hair crap. We rarely opened it because it was such a mess we didn’t want to bother digging. Pointless, right? There’s also a jumble of cords and cases between the hair dryer, my InStyler, and hubby’s razor, plus other miscellaneous items. This drawer has been stressing me for years, so I finally tackled it. I didn’t take an after pic (oops) so I’ll try to get that posted in the next Tidy Up Tuesday, but it’s so much better, if not perfect. 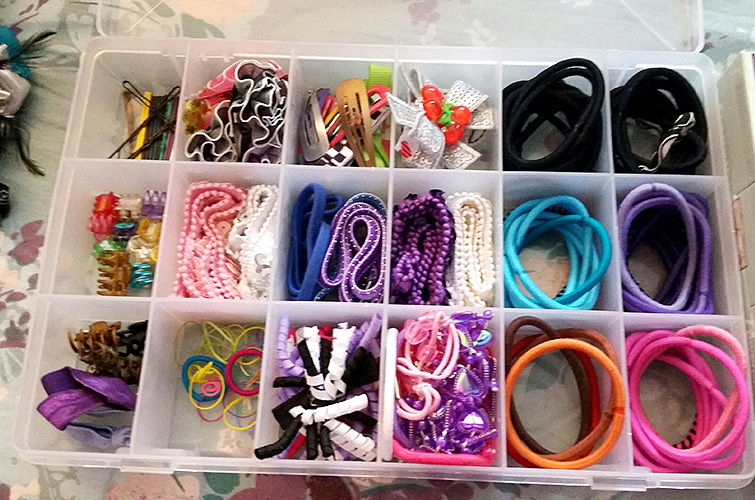 If you have long hair like me, daughters – also like me – then you probably have an insane amount of hair binders and accessories. I’ll probably weed out more than I already did, but for now it all fits, so it’s staying. I actually just bought a whole new back of hair binders because I could only find a couple. Then I clean out this drawer and discover… well.. it turns out I had a lot of binders that were just shoved in the drawers and buried! Amazing, right??? It’s organized by type, size, and the binders are even color coordinated! It fits perfectly in the top drawer with the brushes and the girls can easily choose exactly which color binder or which hair clip they want to wear. (This doesn’t even include their stash of hair bows/flowers hanging on the wall in their bedroom.) Every time I open this drawer now I just feel so happy! And finally, I took an old point and shoot camera box (after throwing out the CD and paperwork that I never even opened in the 5 years since I bought the camera!) and while they fit a little snug, at least they’re easy to see and grab. 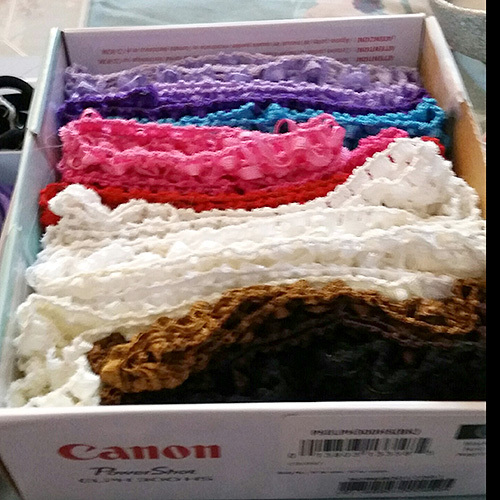 I’ll probably weed these out so I don’t have quite so many identical colors (I’m looking at you white!) But that’s a job for another day. Remember my last post when I said I was going to be better about getting my posts done? Then yesterday when I failed to post Tidy Up Tuesday? Yeah…. I logged off the computer around 9:30 pm or so (early for me) and read for a while on my couch. Then at about midnight I realized I never posted. So…. I’m making up for it today. I won’t lie friends, keeping up the tidying momentum is hard. I haven’t been doing a little bit every day, as I’d hoped, for the past couple weeks. I am keeping up with making sure the drawers remain awesome looking. This is my 4 year old’s sock/underwear/PJ/dancewear drawer. I did make a little more progress in my bedroom, conquering the clutter on my dresser. Ugh. What a mess! The pile on the left is items set aside to sell or donate, they just never made it to the bins. There’s a package of dried out baby wipes. Our “baby” turned four last fall, why do we still have baby wipes floating around??? Hopefully by next week I’ll have made more progress. I just need to pick something and do it, but when there’s so much clutter, it’s hard to know where to start. Now that I’m past the clothing and paperwork, it’s the “komono” (aka miscellaneous) items. And there’s no specific order, so it’s a little overwhelming. I may have to consult my book again and consider my options. My husband had friends over this past Sunday, so he made a lot of progress shifting the clutter in the basement around, so it looks like a livable space. That’s somewhat inspiring to really go through the crap down there and, at the very least, pull out the boxes set for Goodwill and throw them in the back of my van. Goodwill is maybe a five minute drive from my house, but it’s hard to be motivated to leave the house when it’s so cold and snowy out. First, let me show you how good my four-year-old daughters drawers are looking these days. 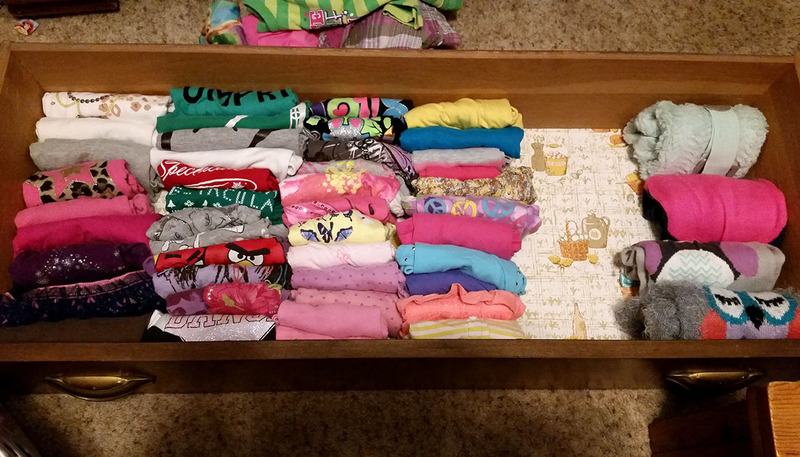 Both she and my (almost) nine-year-old daughter are so excited by their nice organized dressers. I love it! 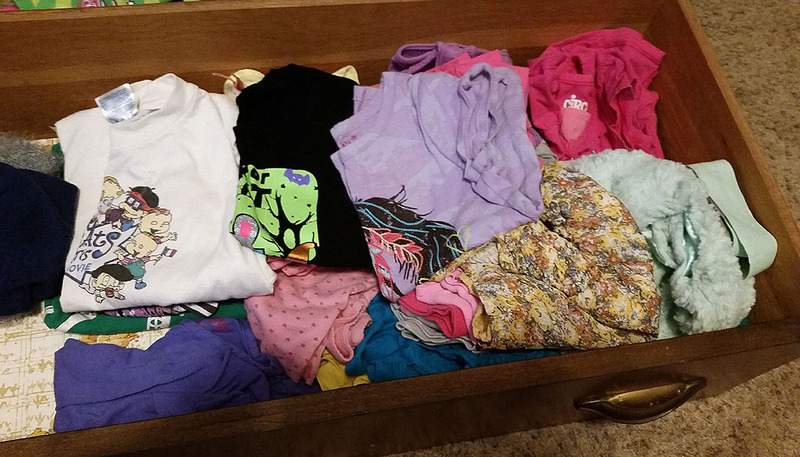 Her shirt drawer before….. what a mess! It was hard to find anything. Her shirt drawer after! It’s so gorgeous! Picking out her clothes for the day is so easy now, she can just look in and point to which one she wants. Now, the KonMari Method is very specific about the order in which you tidy. Just like I was a rebel to read her second book, Spark Joy, before reading her original book, The Life-Changing Magic of Tidying Up, I’m working slightly out of order as I feel inspired. After clothes you’re supposed to tidy up your papers and books. Books is an easy one for me, I’m keeping them all at this time. I cleared out my books last summer and do not yet feel the need to purge any more of them. I’m sure I will soon. KonMari says to get rid of books you’ve read (I’m keeping my favorites, thank you very much!) and the ones you have not read, because if you haven’t read it yet, chances are you never will. Again, I disagree. I bought my books because they looked interesting, I will get around to reading them eventually, and if they don’t become favorites I plan to read again, I will bring them in to Half-Price Books or donate them at that time. Papers, on the other hand, are my Kryptonite. I can’t count the number of times I’ve given up on tidying because I just don’t know what to do with papers. 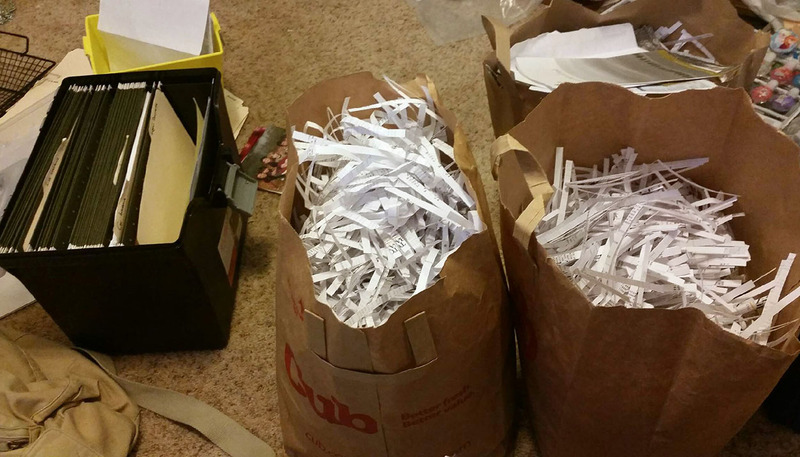 Sure I’ll recycle a bunch, maybe shred a few (or more likely, put in a shred pile to deal with later), and then there’s the pile of stuff I just don’t know what to do with, so it gets shuffled to the side instead of dealt with. Let me tell you, until you’ve cleared out your papers, you don’t know relief. I do have a few papers left to deal with, but they’re bills to be paid once I figure out how to access the health credit money I received at the end of 2015. Then the paperwork is caught up with! Papers to recycle in the paper bag, and papers to file or “deal with” in the yellow. That magazine? I can’t tell you how long I’ve had it. Over a year. I don’t even know where I got it! I feel no remorse in ridding myself of both the magazine or the pile of other magazines in the bag below! My linen closet is tiny. Seriously, it’s ridiculous how small this thing is. And we have a lot of stuff. More than anyone could need or want. Because I’m a rebel, I didn’t purge as much as I really should, but I know I will. And for now, everything fits, and it fits a lot better than it did before. Mind you, I didn’t really touch the top shelf. That’s cleaning supplies and that’s a challenge for another day, but you can see on the second to top shelf how nicely organized everything looks now. Initially I’d had these soft plastic baskets from the dollar store (the one in the closet was bright pink, but I have other colors in the house as well), but because they were round they didn’t really work to stand things up nicely. Everything was always toppling over in there. They do work great as a little laundry or waste basket, but it didn’t work for what I was trying to use it for. 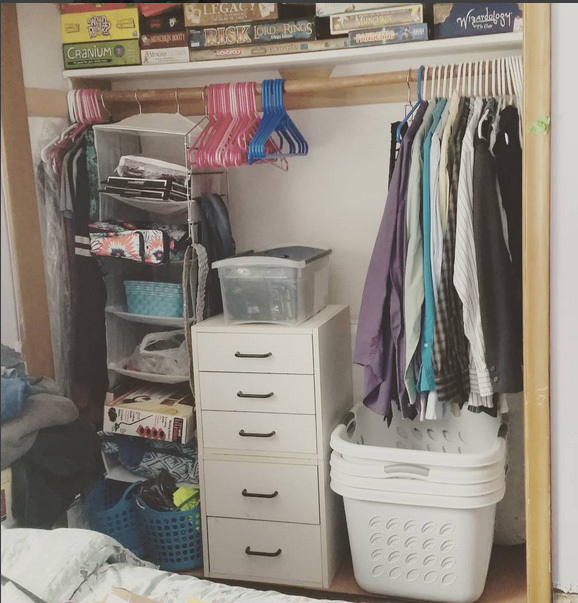 One of the thing KonMari has her clients do is take empty boxes and use them to organize. I don’t have any shoe boxes at the moment, but even better, I found that cute Minnie Mouse tin which contained bath products my daughter received a couple years ago for Christmas, and I kept forgetting about! I took everything out so that they can go into rotation when their current bath soaps runs out, and now it houses all of the travel size bottles of shampoo, conditioner, body wash, baby powder and lotion (and a couple full sized bottles too.) The little blue basket I bought for the nursery when I was pregnant with my youngest who is now four. That’s filled with toothpaste, toothbrushes, and free samples. If you need to pull something out, you don’t need to dig around blindly in the closet, simply pull out the box and find what you need, then replace it. Speaking of free samples, I’m a bit of a hoarder when it comes to those. As soon as I finish off the bottles of various products in the shower now, I’m going to start in on the samples. They do me no good sitting there in their shiny plastic pouches. As for towels, I need to pack some up. I have way too many right now. I know as soon as I stock up on T.P. again, I’m going to have nowhere to put them, so that bottom shelf of towels is going to have to go. In addition to my house having tiny bedrooms and a tiny linen closet, we also have ridiculous drawers in our kitchen. They look beautiful, but they’re not the most practical. They’re either too narrow, too shallow, or both! Trying to dig through to find a wash cloth among the towels (and no, there’s no space to keep them in separate drawers) was a real chore. 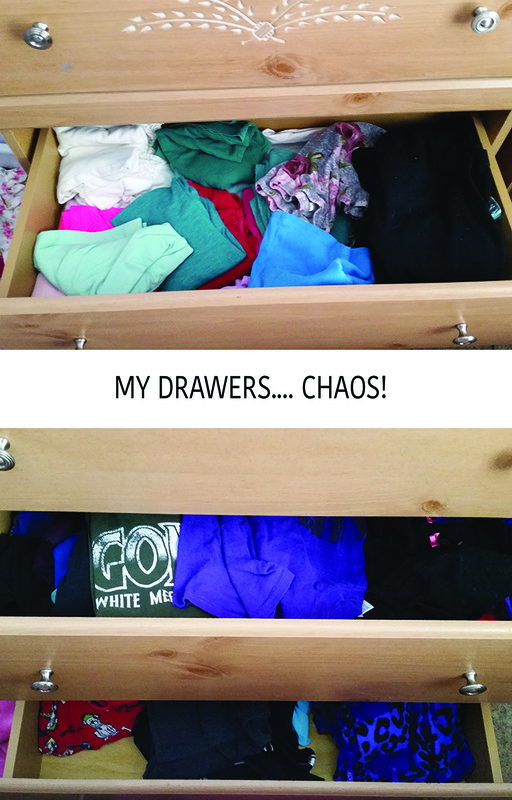 Not to mention trying to close the drawer when we’re done! No more. 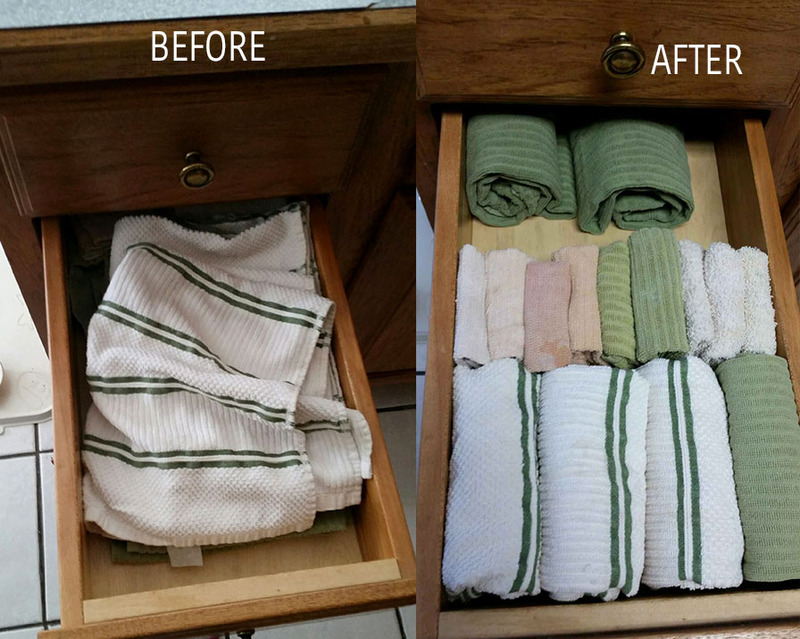 The KonMari folding method works for towels, too! Someday I’ll get my hands on nicer, newer towels. Until then I’ll be happy with just being able to reach in and grab exactly what I’m looking for! That’s my progress for the week! Slow and steady, working to the end goal. I’ll leave you with one last image. I browsed the clearance racks for myself, looking for anything that would cause me to feel that spark of joy. Best of all? When I tried it on, it sparked joy. It’s now one of my favorite pieces of my wardrobe. Once upon a time, there was a girl who was a self-professed pack rat. The girl had a hard time letting anything go because it “might be useful someday” or “it still has life left. I can’t just throw it away” — among other excuses. The girl met a boy and they got married. Together they had two daughters. The boy didn’t like to pick up after the daughters. The daughters didn’t like to pick up after themselves, either. The girl didn’t have the time or energy to pick up after everyone in the house, including herself. Note: These photos were NOT all taken on the same day. Most were taken while the rooms were “in the process” of being “sorted.” The problem I run into is that nothing ever ends up actually sorted, but rather it’s shuffled from one place to another! The girl and her family simply had too many possessions. The girl knew she needed to do something about it, and many times, she tried. She pulled out old clothes, books, toys, and so on, listing them in online sale sites and putting them in garage sales in the summer. Some things sold, but most did not. The clutter continued to pile up. Then one day, the girl decided she would try to win some books through the Goodreads First to Read program. She entered many book giveaways that day and was pleasantly surprised the next day to discover she had been selected as a winner. Which book did she win, you ask? 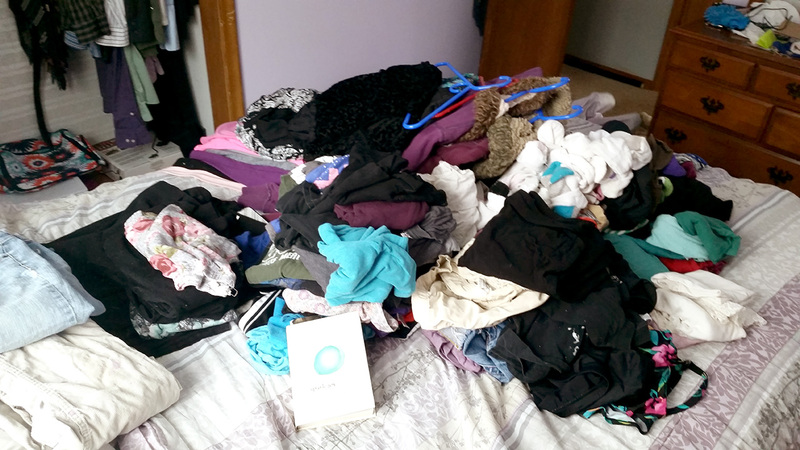 The girl had heard of Marie Kondo and her organizing methods, but had never read her book. 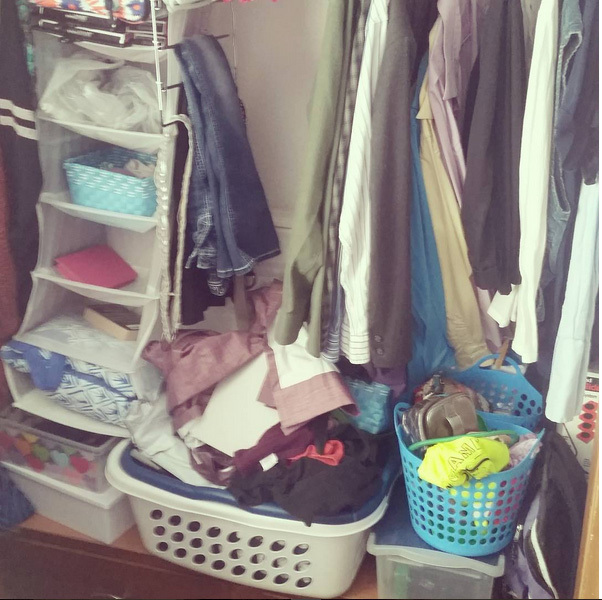 During the summer, only months earlier, the girl had been working in her local Target store talking to store guests about ThredUp.com, encouraging them to clean out their closets and consider sending their unwanted clothing items to Thred-Up in exchange for a Target gift card. On two separate occasions, the girl was told about Marie Kondo and her KonMarie Method. The girl jotted the name down, and then promptly forgot to ever look it up. Inspired by the company she was promoting, she did clear out some clothing items. With her book win, it seemed as though fate had stepped in. When the book arrived at the girls home mere days later, she immediately jumped in, devouring the pages. She read right up until bedtime, then spent quite a long time laying in bed, trying to fall asleep while thinking about how she was wasting time on sleep, and instead should be purging her wardrobe of unwanted and unneeded items. Purging herself of possessions that no longer spark joy. The thus began the girls (ongoing) journey from pack-rat to minimalist………. This is my story. My life. For reasons I really can’t identify, I have a hard time letting things go. I know they’re just possessions. I know that in most cases they can be replaced. I still can’t bring myself to let things go. Anyone who has seen the TV show Hoarders can tell you that this is a psychological issue. The struggle is real. While I’m no where near as bad as the cases profiled on Hoarders, my family does have a problem and I’m the only one who can fix it. In Spark Joy by Marie Kondo (which I will be reviewing soon – promise!) the reader is encouraged to read the original book first (The Life-Changing Magic of Tidying Up: The Japanese Art of Decluttering an Organizing.) Being the rebel that I am, I jumped right in on Spark Joy because, well, I already had it. From what I gather, the main reason to read the first book first is to help the reader really decide to tidy up. I was already at that point. She states at one point in the book that some people really need to hit rock bottom before they can start really tidying up their homes, and therefore, their lives. Rock bottom is where I am. I’ve been here for a while and tidying has always failed for me. 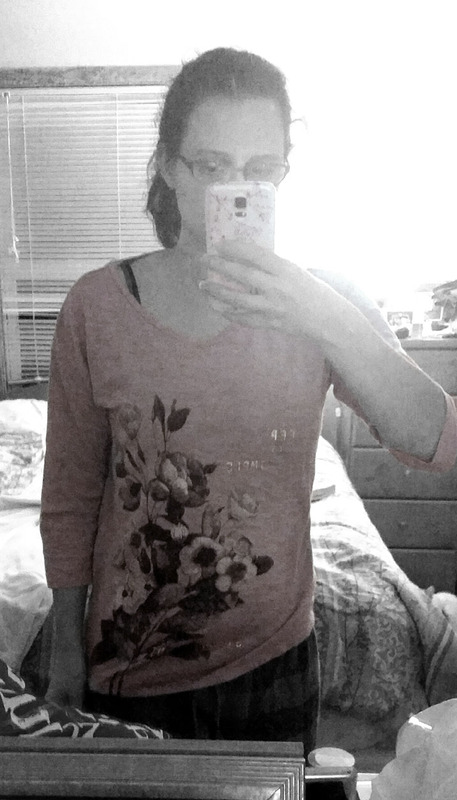 Before I talk more about the KonMarie Method, check out my mess of a bedroom. I’ve been in my house going on 7 years now. From almost day 1 it’s looked like this. We have simply too much stuff and we don’t know how to store it. Thankfully, with the things I’ve learned, we’re getting there. This is a somewhat sloppy panorama of three walls of my bedroom, which I put together in Photoshop, using photos taken on my smartphone. 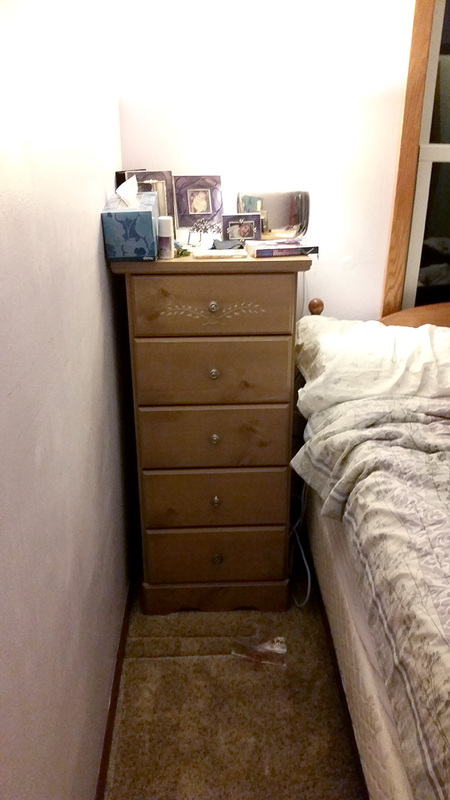 There was about 1 foot to walk between the light colored dressers and the bed. About another foot between the side of the bed and the wall not pictured. It was NOT fun. 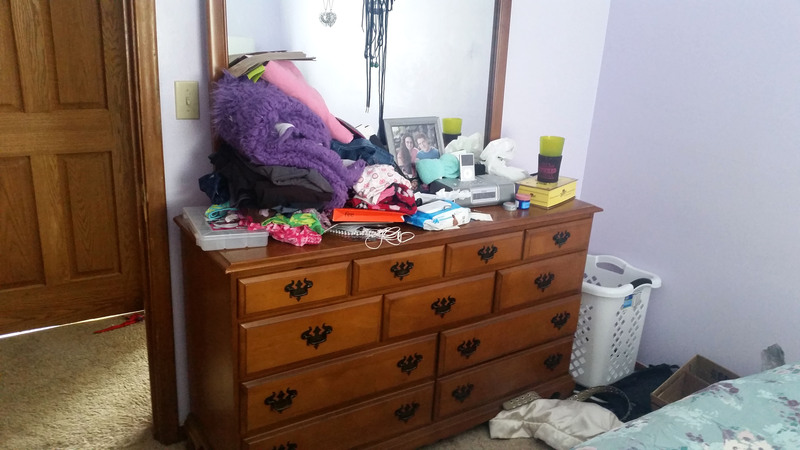 What you can’t see, is on the floor next to the light colored dressers are a couple of laundry baskets full of miscellaneous items, most of which have no business being in the bedroom! I’ve tripped in the dark many times. 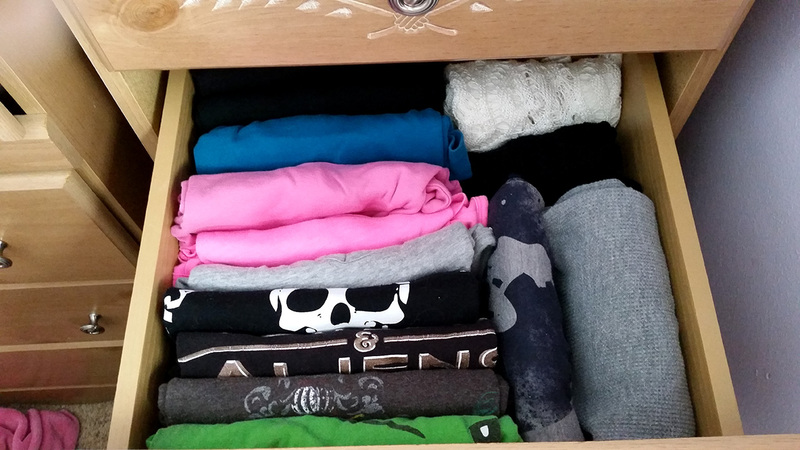 The KonMari Method has you start with clothing. Gather up every piece of clothing you own in one place. Then sort through it, hold it in your hands or try it on if you must, and feel it. Does it spark joy? If yes, keep it with confidence! If not, say goodbye. There’s a lot of talk that can inspire some eye rolling, especially those of us raised in America. Marie Kondo literally wants you to say goodbye and thank the items you’re getting rid of. It sounds hokey, I know, but I promise it can help, at least it did for me. She talks of items that spark joy, which can be hard to imagine at first. I didn’t really know what she was talking about, until it happened. 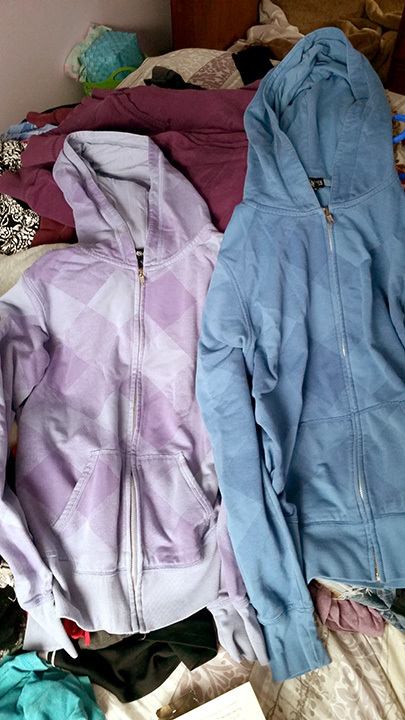 I had two identical hoodies in different colors. I put the blue one on and thought to myself, This fits. It’s comfortable. I guess it sparks joy? I’ll keep it for now, I can always change my mind later. THEN I put on the purple hoodie. A small smile spread across my lips as I looked into the mirror and realized this purple hoodie sparked far more joy than it’s blue counterpart. With confidence I put the blue in the ‘get rid of’ pile and moved the purple to the ‘keep’ pile. I may still get rid of the purple one in the future, but for now, I’m choosing to keep it with confidence. The purple hoodie was my first feeling of joy during this process, but not the last. 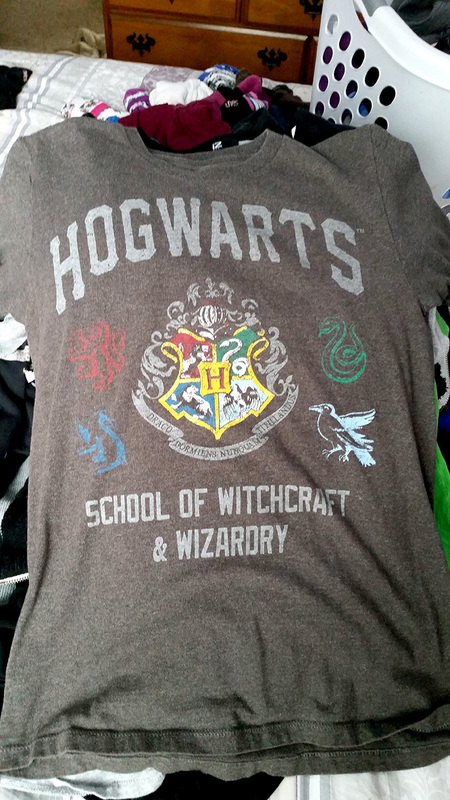 The ultimate joy I felt during my clean up was when I picked up my Harry Potter graphic tee. As soon as it was spread in front of me a grin broke across my face. There was absolutely no thinking required, this is one of my favorite items and I was keeping it. 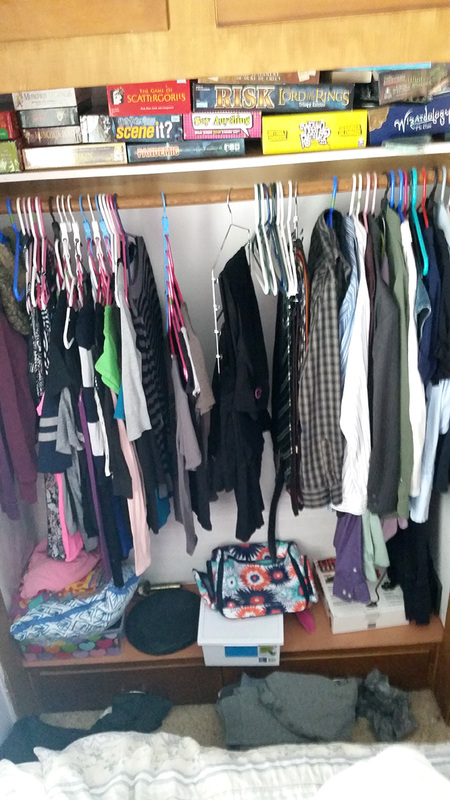 This is the closet before “the purge.” Somewhere around the middle separates my clothing from my husbands. (The yellow board game is right about the start of his side.) And as you can see, the bottom is cluttered. We also have some clothing items scattered on the floor. (The floor stuff is 100% his fault! That’s his side of the bed!) At the very bottom we have a couple of nice drawers which were not being put to very good use. What about items we “know” we love? I had two sweaters I received a good 8 or 9 years ago. They’re still in good condition, I took great care of them. They were nice sweaters, perfect for an office job or a holiday party. I loved them, but realized I haven’t worn them for a year or two. As I held them in my hands, I realized the spark of joy I used to feel when seeing and wearing these sweaters was gone. As we grow up, our tastes and feelings change. Just like I no longer love the band Hanson like I did when I was 13, I no longer love these sweaters. I posted pictures of them on Facbeook and asked friends if any were interested in purchasing them for a couple bucks each. A friend of mine from high school will be trying them on soon and probably buying them. It’s good to know they’re going to a good home, and nice to have my closet a little emptier. How did I ever find what I was looking for before??? Once you’ve decided what to keep and what to get rid of—and both Marie Kondo and I encourage selling or donating items that have life left, and trashing those that are stained or with holes—it’s time for storing them. Marie Kondo recommends using built in storage before all else, which makes sense. She also talks about moving dressers into closets, which simply won’t work in my home. I mean, look at my shirts? I used to keep my graphic tee’s in the closet where it was nearly impossible to find what I was looking for. Now I need only pull open the drawer and glance down to find exactly what I want. Down to one dresser! Which is actually nearly empty, so it may end up as storage for the overflow items from the hall closet. It functions well as a nightstand though. I just need to clear the top, but the first assignment was clothing. 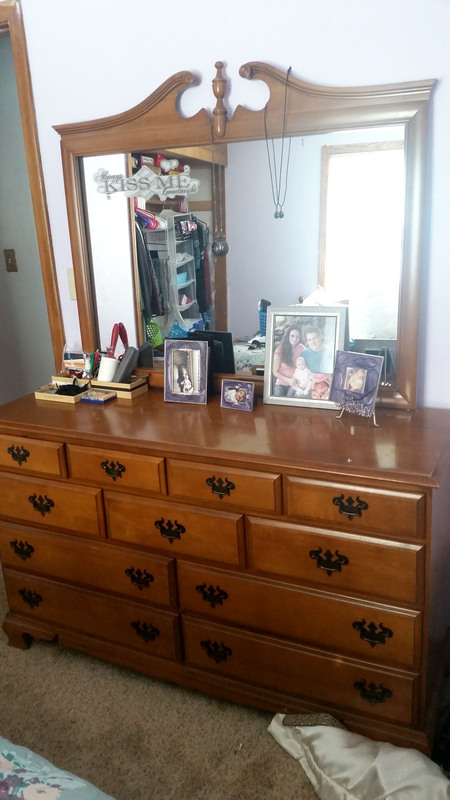 I honestly didn’t even get rid of all that many articles of clothing, but we went from the big dresser with the mirror, the big light wood colored dresser, and the smaller light wood colored dresser to JUST the big mirror dresser! For both of us! We’ve left the smaller of the dressers in the room, but removing the larger dresser has improved the flow of the room by leaps and bounds. It’s amazing how removing one piece of furniture can do all that. Stay tuned for more updates on my progress! I’m planning on making this an every Tuesday thing. Next week: Books and papers!